Typical Japanese Style Guest House. Only 7 min. from Kanazawa Station on foot, and located by the beautiful Kuratsuki canal one of the main tourist trail. 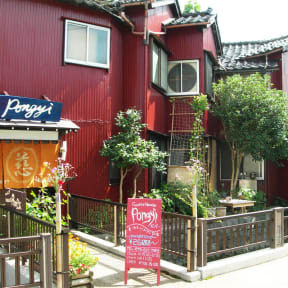 Pongyi is a hostel aimed for short-stay budget travelers and backpackers. 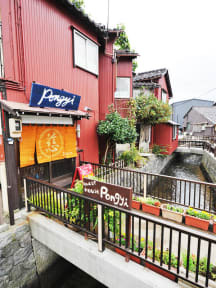 It is especially suited for those travelers looking for more atmospheric and authentically Japanese accommodation. All of Kanazawa's sights are easily accessible from the guesthouse. *100 yen donation to aid children in Asia is included in the price. 1. Free wireless internet available throughout the property. 4. Every single bunk bed comes with a pillow, pillow case, bottom sheet and a coverlet. 5. Communal lavatory and hot shower. *Shampoo, Rinse and Body soap. free of charge. 6. Free locker with padlock. 8. Fully equipped communal kitchen. 11. Hair dryer for rent (free of charge). 1.7 minutes walk to the nearest Kanazawa Loop Bus stop (access to all major sights). 3.20 minutes walk to Kanazawa Castle Park and the adjacent Kenroku-En Garden, perhaps Kanazawas best loved sight and among the top three most scenic gardens in Japan. *In Kanazawa City, a new accommodation tax will be implemented starting April 1, 2019. *If you wish to cancel, please contact us up to 1 week before you stay. If you cancel after that, we will charge you a cancellation fee. Ostello carinissimo e personale incredibilmente gentile, sempre sorridente e molto accogliente. È stato come essere in famiglia. Mi hanno consigliato i luoghi da visitare e ottimi luoghi in cui mangiare tipico. L’edificio è storico ed è stato ristrutturato per renderlo un ostello. Letti comodi e tutte le stanze bagni inclusi sono piacevolmente decorate e pulite. Lo staff organizza piccoli eventi serali per far conoscere la cultura giapponese. Tornerò sicuramente!